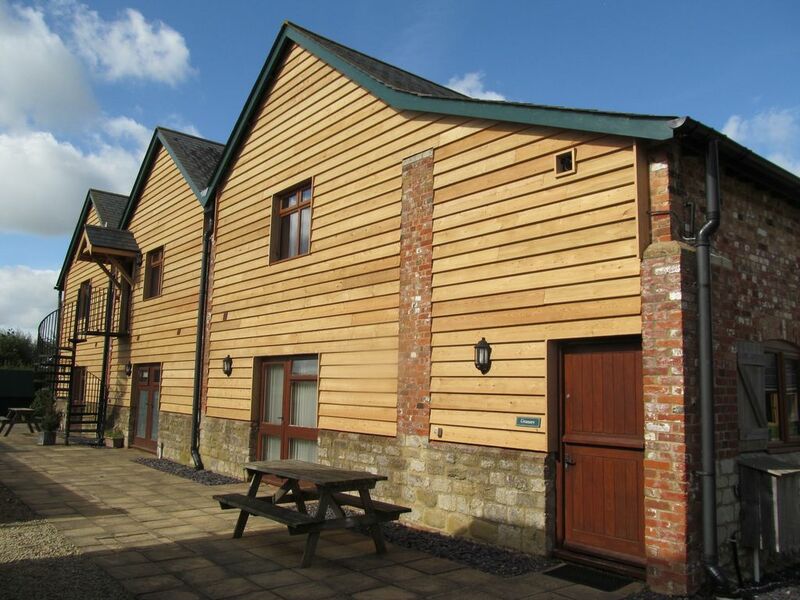 Welcome to The Victorian Barn, a collection of 11 picturesque holiday homes in beautiful Dorset. Set in peaceful, rural surroundings it is the perfect base to explore. Superb shared onsite leisure facilities include an indoor heated pool, gym, sauna, hot tubs, games room & fishing lakes plus super-fast WiFi. Within easy reach of the Jurassic Coast, children’s farms, museums, soft play, animal, water & theme parks, historic castles, cruises & steam railways with Somerset, Devon & Wiltshire nearby. The Granary, on the south wing of the The Victorian Barn is a spacious two bedroom attached barn conversion, sleeping up to 5 guests. It has two first floor ensuite bedrooms. One double and one triple bedroom with three single beds, both bedrooms benefit from wall mounted flat screen TV's and fitted wardrobes. There is also an additional ground floor bathroom. The large open plan ground floor offers a comfortable carpeted lounge with sumptuous leather seating, coffee table and wall mounted 42" SMART TV plus a fully fitted kitchen including a dishwasher with tiled floor. There is also a large farmhouse dining table upon the tiled floor of the kitchen with dining for 5 guests. The Granary offers super-fast WiFi throughout. There are two entrances for The Granary, a stable door into the kitchen area or double doors into the lounge. These lead onto a sunny patio with a picnic bench. We are pleased to be able to offer superb onsite leisure facilities, open all year round. Hello! Our names are Penny & Claire and we are a mother and daughter team owning and managing The Victorian Barn. We pride ourselves on providing excellent customer service and fabulous accommodation for our guests. We would love to welcome you soon. This property has a very special place in our hearts as it is where Claire has grown up and we have been farming here since the late 1960's. After dairy farming for many years we converted the buildings for holiday accommodation. We still run a small beef farm a short distance from the barn so guests can see cattle in the fields while enjoying the fresh clean air of open countryside. The Victorian Barn benefits from amazing views, they are completely unbelievable and you have to come here in order to absorb them. In fact, the view from our reception is truly awe inspiring. We also offer superb facilities such as the indoor heated pool, hot tubs, gym, sauna, childrens play area, games room and fishing lakes. All linen and towels provided for up to 5 guests. This includes 2 pillows per person and a duvet, plus white cotton linen & 1 hand and 1 bath towels per person. Onsite washroom with washing machine & tumble dryer shared with other guests and pay on use. Ample safe parking near to the property. Unloading of your bags can be offered just outside the property. Complimentary unlimited Super fast WiFi. 1 hand towels and 1 bath towels provided per guest. Please bring your own swimming towels for the pool. Gym onsite with treadmill, cross trainer, bike, rowing machine and free weights. As well as our superb indoor heated swimming pool & sauna. Activities Suite with badminton court, table tennis etc. Very spacious lounge with comfortable leather suite plus 40 inch SMART TV. There is also a coffee table and soft wall lighting plus a well stocked attractions leaflet rack and welcome booklet. Complimentary welcome tray of tea, coffee, sugar and biscuits with a starter bottle of milk in the fridge. Salt & pepper also supplied. Plenty of pots & pans, crockery, cutlery and glasses for 8 guests. Fully fitted country style kitchen with dining for 4. Kitchen contains dishwasher, fridge & freezer, toaster, kettle, pots and pans. Iron & Ironing board and well as cleaning equipment. Music can be found on the TV's & YouTube. With coin operated pool table, football table and quiz machine. A lovely warm space, opposite our swimming pool for all out guests to enjoy. Games Room with board games plus pay on use quiz machine, Football table and pool table. 50 p per game. Cues can be collected from reception. Lots of lawn areas, shared with other guests to enjoy for games and relaxing. Patio area, just outside the property with garden furniture, perfect for BBQ's and enjoying country living. Not enclosed. Shared sauna within the swimming pool building. Indoor heated swimming pool. The water temperature is heated to 30-32 degrees, so is perfect for babies and guests of all ages. Opening hours can be found on our website. Communal hot tub, shared with 4 other properties. We also have 3 Course fishing lakes available to fish or just to enjoy for a nice walk.